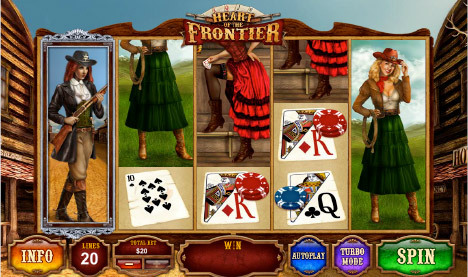 Fly Casino now has Heart of the Frontier online slot to play. This Old West themed slot is filled with awesome game play, sounds graphics, ways to win and bonus features. This new slot is a 5-reel, 20-line game that provides you with stacked symbols on every reel providing the opportunity to line-up some very interesting and large winning combinations.. The sheriff and bandit symbols both expand to fill the entire reel and act as a wild symbol; they will then move one place to the right (sheriff) or left (bandit) until they drop off the reels in successive spins. Almost like a sticky wild, but they move with each spin. Fun! Now, the bonus feature part! 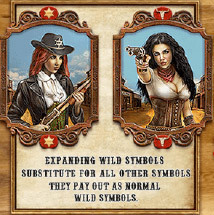 If they both wilds appear on the reels at the same time, then you are awarded the Showdown Free spins whereby you will be issued 5 free spins with those expanded wilds locked in place! If you get further sheriffs or bandits landing will also expand and remain in place until the free round ends. Play it today – it’s an awesome game! $200.00 Super Value Sunday! On Sunday from 00:00GMT until 23:59 GMT, all members will receive a 100% bonus up to 200.00 on your deposits of JUST $/£/€10 or more. 10 Gets 15 X 5. From 00:00GMT until 23:59 GMT, all members on their deposit of just $/£/€10 or more will receive $/£/€15 bonus. You can claim this bonus 5X! 133% Big Money Tuesday! From 00:00GMT until 23:59 GMT, all members are invited to receive a 133% bonus up to $/£/€266.00 on your deposit of just $/£/€10 or more or more.